Storey’s Field Centre is a landmark building in Eddington, a newly developed district in the north west of Cambridge on a triangle of land between Huntingdon Road, M11 and A14. The vision for Eddington is to create a new settlement with strong links to existing neighbourhoods, ambitious in scope and scale with a vibrant, active community and with a strong emphasis on sustainability running throughout the whole development. Storey’s Field Centre is a key part of the vision for Eddington offering an open and welcoming space for the community to come together with people from Cambridge and the surrounding area. 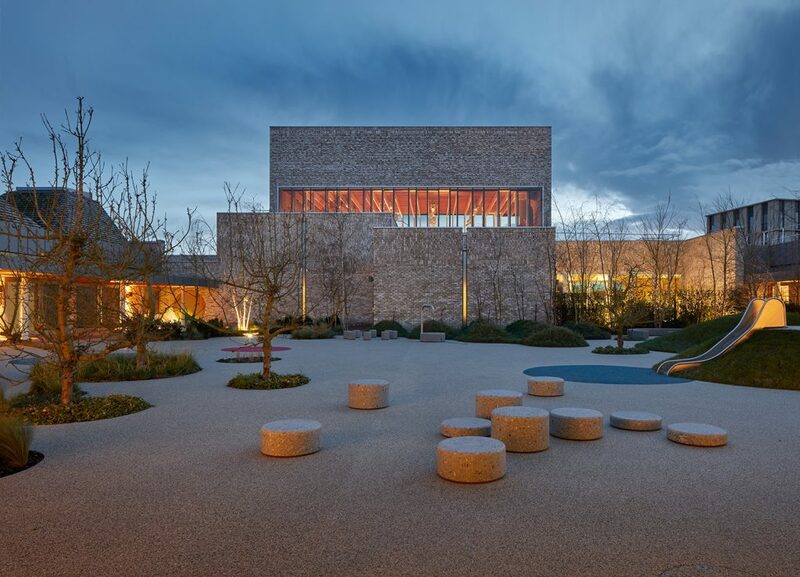 The Centre, which opened in Spring 2018, has been designed by McInnes Usher McKnight Architects (MUMA). Storey’s Field Centre provides a range of flexible spaces that will cater for a variety of uses and residents’ needs. 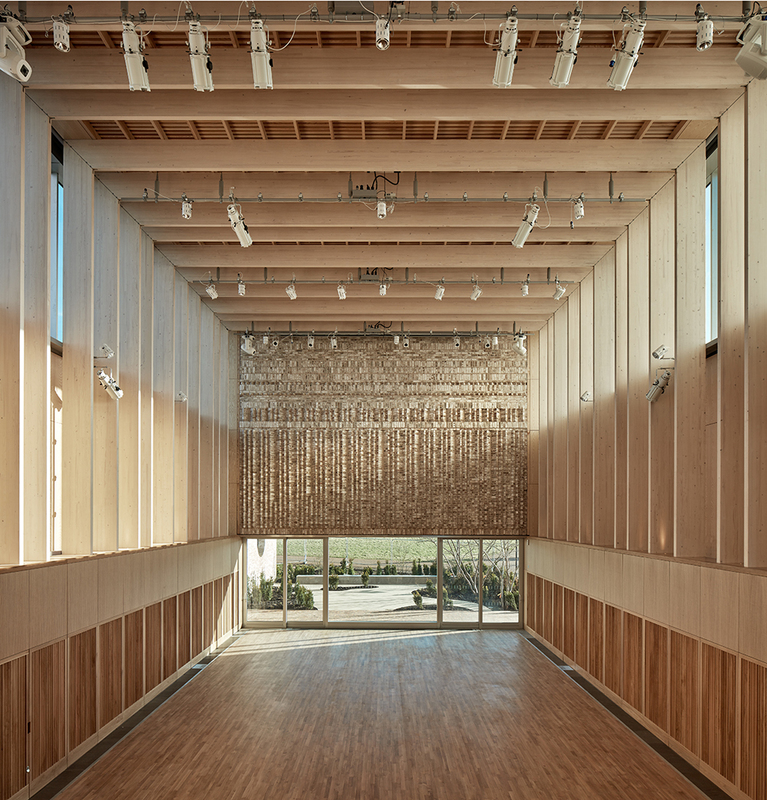 The initial brief to the architects – MUMA – was that this space should host a wide range of activities from theatre shows to fitness classes, from bingo nights to art shows, parent and toddler coffee mornings to tea dances and from chamber music concerts to local rock band nights. Acoustic design plays a large part in the look and feel of the building. The hall’s design and proportions are based on Cambridge’s college chapels and great halls. This means that the natural acoustic of the hall is stunning making it perfect for chamber and choral music. Specially designed motorised acoustic banners can drop down from the ceiling to line the highly reflective walls to enhance spoken word and amplified music events. Complete with demountable staging, 48 way lighting system, column array sound reinforcement and high quality laser projector to enable a wide range of performances and conferences to take place. The main hall can seat up to 180 people with a sprung dance floor, a balcony and some dedicated storage. This hall will suit a range of uses from classical concerts to conferences, gigs to dance classes, ‘Jazzercise’ to Woodcraft folk, film clubs to fashion shows, weddings to art displays.